People have been painting their faces and bodies throughout history. Our ancestors began face painting for hunting, camouflage, military or cultural reasons. Today, people continue this fascination with transforming their bodies by hiring a face painter for special events. Use our helpful resource for finding artistic entertainers in your area of Austin, Texas. Before booking, scroll to the bottom to see everything you need to know about hiring a face painter. You're in the middle of planning a birthday party, and your child decides they want a face painter. Perfect, you think, a face painter isn't too expensive and the kids will be occupied while waiting on line for their turn. 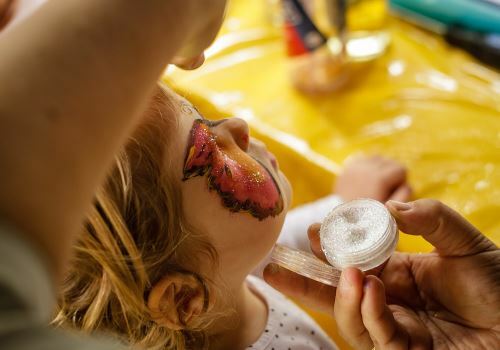 Before booking a face painter in Austin, Texas, there are a few things you should know. First, be sure that they are using the right type of materials. It is not enough for the paint to be "non-toxic." Many reputable artists, for example, proudly advertise that they use only "FDA-compliant" or "cosmetic-grade" products. Otherwise, your guests could leave with irritated skin or an allergic reaction. You should also make sure that your artist takes care of their equipment and regularly cleans and sterilizes their brushes, sponges and stencils. The most important thing is to make sure your face painting artist is as reputable as they are talented. Allow KidsParties.Party to help you find the best in your area that will come to your party. Are you an Face Painter? Don't waste a moment! Sign up right now to get listed on our site. Looking for more ways to make your child's birthday unique? We have over one hundred tips on how to turn the old boring birthdays of the past into something new and exciting. You can even create your own birthday cards for your little one using our new invitation making software. Find your favorite birthday wish for your son, daughter, or anyone else to fill in the card. Of course, you can use the invitation maker for actual invites too! We have templates in all themes, or start with a blank card you can customize yourself.